I taught my adult art class this morning and called into the studios to collect something before driving off to deliver three paintings. One of the other artists asked me if I’d heard the news about Chris Cornell and it was clear from his tone that the news was bad. In 2012 my friend Andy and I went to see Soundgarden at the Download Festival. It was the first time I had been back to this festival since working on the crew at it when it was called Monsters of Rock. Soundgarden did not disappoint us and we left the festival with a real sense that we had seen a band that just oozed class. 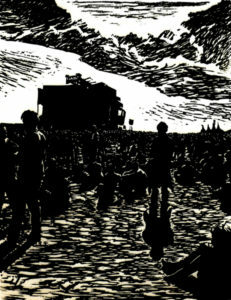 It was sometime later that I finally got around to producing two versions of a lino-cut inspired by our Soundgarden experience….”Worshippers At The Temple Of Rock version 1″ and version 2. 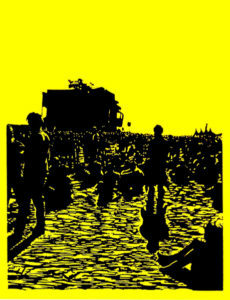 A short time after we returned from Download, Andy, my wife Mel and I went to see Chris Cornell on his “Songbook” tour. In short I was blown away by his performance. One bloke, on his own with just a guitar under his arm captivated the entire audience with a such a variety of talent. His was a special presence. I find it easier to express myself visually rather than with the written word. 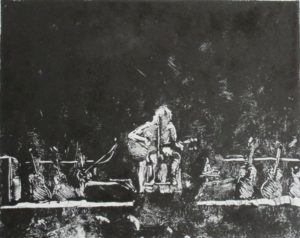 I tried to describe the Songbook experience by producing firstly a mono-print and secondly through an etching. 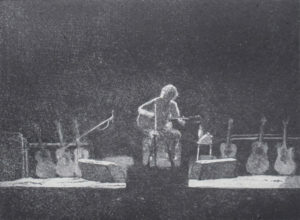 One man, alone on stage with a selection of guitars and with the audience in the palm of his hand. Thank you Chris Cornell, for the music and the inspiration.